There's no question that accessories can transform your wedding day ensemble—giving you that extra bit of glamour you've always wanted on your special day. We're sharing our bridal accessory picks that are sure to make you look and feel fabulous on your walk down the aisle. Infuse your wedding day apparel with a hint of romance, with these fashionable hairpieces. 1. 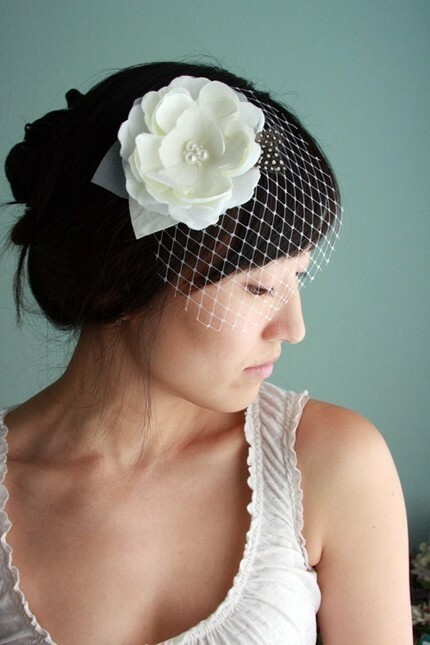 Dove Hairpiece – Do you like the idea of a traditional veil, but don't want to deal with the fuss? Twigs & Honey has solved your woes with this elegant headpiece. The veil is fresh, modern and understated—and the dreamy floral accent adds a new twist to a classic favorite. Headpiece, at Twigs & Honey. 2. The Rose – Less is more at Austie. Made of dupioni silk, this simple rose headpiece will add a touch of sophistication to your bridal look in a soft and unexpected way. Headpiece, at Austie. Mix things up with these convertible wraps made of the finest fabrics. 3. Antique Ivory Silk Taffeta Bolero – Featuring ruffle accents and a stand-up collar, you're bound to make a statement in this silk taffeta bolero from Elizabeth Dye. Bolero, at The English Dept. 4. Ruffled Collar – Wrap up in this colorful ruffled collar from Kate Towers. The elegance of this wrap lies in the details, with hand-dyed fabric and a silk satin ribbon tie. Collar, at Kate Towers. The right shoes can add an unexpected touch to an otherwise classic bridal ensemble. 5. Crystal Kaleidoscope Slingbacks – You're sure to stand out in these jeweled heels from J.Crew. Although the sandal is traditional, the t-strap beading is anything but—giving the old standby a unique and fashionable kick. Shoes, from J.Crew. 6. Ballet Shoe – Who says you have to wear heels on your wedding day? These luxurious silk satin ballet flats from Grace Footwear are modern and comfortable, so you can dance into the night in style! Shoes, from Anna's Bridal. Engage the senses with these fragrance suggestions. 7. Delicates Soap – Keep this delicates soap set from Laundress on hand during your wedding. The set includes your choice of a delicate wash, static solution, and wash & stain bar so you can be prepared for any fashion emergency. Did we mention how great your clothes will smell? (Trust us—the sensual earthy citrus scent is heavenly!) Soap set, from Souchi. 8. The Perfume House – Selecting a fragrance for your wedding day is a personal choice, so we recommend talking to the experts to find a fragrance that is perfect for you! The Perfume House, located in Portland, is the world's largest perfume store—so you're sure to find your winning selection that will conjure memories to last a lifetime.